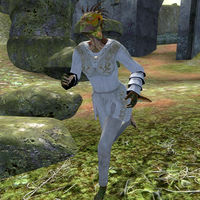 Runs-in-Circles is an Argonian thief living in the settlement of Highcross. Her manic derangement is, as her name suggests, running in circles around Highcross. Her clothing consists of standard Mania grey trousers and grey tunic. She carries her key and a medium-sized amount of gold. She doesn't wear any shoes, and she may ask you for them. You can offer her any lower-class and Shivering Isles-added shoes, though, she will actually take away from you only original Oblivion ones. Besides shoes, she can also ask you for money, making you able to give her a gold coin, and food: you may offer her an apple, carrot, pear or a Poisoned Apple, which she will eat straight away. If you refuse to help her, she will become anxious and run away, repeating her trademark cry of "ni-ni-ni-ni-ni" (this can be useful when you want to find her in town). Runs-in-Circles may also ask if you saw her sanity go by, one of the few residents of the Shivering Isles who realize that they have lost it. She knows the standard leveled Healer spells. Her house is the easternmost house in Highcross. The two chests on the southwest wall contain armor and weapons in one, and gold and jewelry in the other; both are non-respawning, as are the six clutter sacks in her house. The four barrels contain food as does the cupboard, and two chests of drawers and another chest holds more clutter; all are respawning. On the table next to the food cupboard are two thorn hooks, four withering moons, an aster bloom core, and two sweetrolls. Two bottles of Bernice's Summer Wine and a bottle of Fellmoor Spore Wine sit on top of the cupboard. A flame stalk sits on a bookshelf, and five screaming maws sit in a bowl in the upstairs bedroom area. When you greet her for the first time, she will kindly greet you, hoping you'll follow up on the request she asks you afterwards: "Ah, a stranger in town. But as I always say, a stranger is just a friend I haven't met yet! Hey, friend, do you think you could help me out? I'm caught a bit short at the moment... anything at all would be much appreciated." With the standard "Have a coin, beggar" line, she will be most pleased: "Thanks! Thanks a lot!" If you admit you can't help her at the moment, your refusal to give her anything will freak her out: "Oh no. Oh no no no. No no no no no no no!!" If you bluntly tell her to get lost, she will freak out as well: "What? What did you say? What did you say?!" And when she does freak out, she will start running around yelling: "Ni-ni-ni-ni-ni-ni-ni-ni-ni-ni!" Have you met the newcomer, yet? Rich, maybe? Kindhearted, or just another skinflint? Hey, did you hear the Gatekeeper is dead? That's valuable information, don't you think? Worth a few coins? This Resonator thing-a-ma-jig. I don't get it. What's it for, anyway? Here's one you haven't heard, I bet. The Duke's got his Chalice back. Hmm? See what I mean? Now, what can you do for me? This'd be a good time to have a friend with an ear to the ground, what with all the crazy goings-ons in Crucible, you know what I mean? The Great Torch is burning again! This calls for a celebration! You can spot me, right? Just a few gold? I know we're not part of Dementia, but I think their new Duke still deserves a toast, don't you? You're buying, right? Not every day we get a new Duke! Let's celebrate, you and me! Whaddya say you buy the first round? The Fringe was destroyed! Did you hear? Gone. Everything turned to dust! You don't think that could happen here, do you? What do you say we drink a toast to the new Gatekeeper together? Hey, could you spot me, just this once? They SAY the armies have been restored. But you think that's the whole story? Not by half, just you wait and see. Sheogorath gone. The Duke gone. This whole thing is making me really, really nervous. I need to calm down. Victory calls for celebration, don't you think? I wish I had the coin to drink a toast to Sheogorath. When taking shoes, they are added to her inventory, however, she doesn't put them on, making it almost a meaningless feature. It is possible that after killing Runs-in-Circles that she will continue to cry "Ni-ni-ni-ni".